Most notably, I'm thankful to Marli! She's the one who pulled the trigger on this decission! For ten-no-uchi, my left hand is too high. My right hand wanders over the tsukagawa. It should stay firmly at the top. In kihon practice, after receiving men, I should turn on the spot instead of stepping sideways and turning. In kirikaeshi, I receive my blows incorrectly. In geiko I'm too tense and rigid. I'm very happy about the fact that I did pay more attention to my fumikomi! I was conciously trying to make improvements in that! Also, I used my bogu for the first time this evening and I'm very, very happy with it! I still need to break in the kote, but every piece of the kit feels comfortable and suits me perfectly. A great night! And now I'm off to bed! The day at the dutch national kendo championships started with the NK for kyu graded kendoka: those "beginning" players who have not yet graded for the first dan (anyone below black belt, would be the karate parallel). Realistically this means pitting folks against each other with 0-4 years of kendo experience. Five players from Renshinjuku Almere had registered and each was placed in a different poule. I'll come out and say it right now: my performance was awful, mostly due to my mental state. I went into this completely wrong, forgetting everything I've learned about kendo over the past year. It is often said that a kendo is a dialogue between two warriors. They speak through their shinai and bodies, thus determining who will strike when the time is right. Simply trying to overpower your opponent will almost never give proper results. And yet, that was exactly what I was trying to do: I was trying to assert my own will over my opponents. In my mind, I had a point to make: "I may be a rookie, but I won't be overpowered by you! Here! Have at you!" And thus I would immediately launch into an ill-advised attack. Within fifteen seconds from the starting command I would force myself forward, predictably aiming for kote. Whether there was an actual opening, whether my kamae or maai were right, whether I even had a chance? I didn't take any of that in and I simply attacked. So very, very wrong. In both cases I was out within fifteen to twenty seconds, with four nicely places men-strikes against. In both cases I thanked my opponents for an educational experience, whose lesson I would only figure out later that evening. First off, I'd like to give special thanks to Kris-fukushou for his guidance during our day at the NK kendo! It was a huge support for us newbies, to have him take some time away from Museido Dojo and to coach us. Thank you Kris! Also a hearty congratulation to Museido for winning third place and to our mother-dojo Renshinjuku Amstelveen for winning first place! Originally I was going to take part in the NK Teams as part of the Renshinjuku Almere team, but that took a turn. There were six of us and because Jeroen hadn't fought today, I offered him my spot on our team, putting myself in the reserve seat. It's good that I stuck around, because Kris was approached by a member of the jury, asking about Houdaifa's age. Turns out that the age limit for the NK Teams isn't 16, but 18! Which meant that I got switched in for our second competition in our poule. Peter tells me my kamae was bad. Pretty damn open even, while I thought I was closing things. My posture was slouched, though I think this was due to me compensating for the ill-fitting helmet. I was still too eager to strike. I wasn't waiting for openings, or for mr. Weber to attack. I rushed in. Stemming from that, I rushed in from longer distances, closing quickly hoping to land a quick strike. In both cases I'm told that my moves were utterly predictable. Very easily readible. Then, as for our team? I'm sad to say that, honestly, we were not a team. We were six kendoka who train together and who spent the day together. We were the least experienced team and it showed. Nothing but good about the fighting prowess of my sempai! I'm greatly impressed with how they all did and I will have plenty to learn from them in the years to come! And our attitude amongst eachother is great! We're a positive and friendly group! However, outside of the fighting we weren't very good. We have a lot to learn about order and displine. Nobody was in charge, or took charge. We were late in starting our warming up in the morning. Prior to the NK Teams we did no huddle and no warming up. Our grasp of etiquette is very loose and reihou towards team members and opponents alike was messy. During the day I was too overwhelmed by the spectacle of it all, but afterwards I'm honestly a bit ashamed. Ton-sensei, Hillen-fukushou and Kris-fukushou say it often: training once a week is not enough. By only spending two hours a week together we barely have enough time for basic training and some geiko. Let alone time to learn etiquette and equipment maintenance! If there was a chance to train twice a week with our dojo, I'd jump at the chance! And I'd love to help in any way needed to set it up! Heck, I'm already training several sempai in the maintenance of their gear! Tomorrow I'll take some time to write about the rest of the day and my participation in the individual NK for kyu-graded kendoka. Today was an excellent day! In the morning I got a bit anxious about Marli and Dana being home alone, what if something'd happen and Marli couldn't make it to a phone? You know, the general anxiety stuff I live with. I'd taken care of all other possible worries I might have, but this one stuck. So Marli spoiled a surprise she'd prepared! She'd arranged for our good friend Michel to pick up her and Dana, so they could come and watch too. Awesome! I'm so grateful for Michel's help! I picked up Tiamat and Kris-sempai at Almere station at the appointed time: 0845. We then made our way to Zwolle, arriving nicely in time. We made some small talk with our class mates and got dressed. Kaijuu also showed up around that time, so that was a nice reassurance for me: one of my best friends would be sticking around all day! The sports hall at Landstede is awesome! A huge wooden floor, with nice lighting and good seating provided a great arena for our tournament. Shinai checking occured at 1035 and both my shinai passed muster. We found out our poule arrangement for the individual tournaments and also ascertained when our dojo would fight in the teams compo. Finally, we were a bit late getting started with the warming up. All the other groups were ahead of us, so we hurried it a bit. I have to say: I always thought our groups kiai during warmup to be nice and loud, but boy do other teams have wonderful kiai! I don't know who they were, but wow! It was like thunder rolling in! You can read about my participation in the individual matches here. Once I was out of the kyu grades compo I had lunch and talked with my family. Marli and Dana had arrived before I got started and my father also made it in time. So cool! I'm so grateful for such supportive family and friends! I did my best to study Nick and his opponent in Nick's final fight. That was a great fight! You can read about my participation in the teams matches here. All through the day Dana had been a champ! She had talked and played with Marli, grandad, Kaijuu, Michel, Christa and with a few kendoka. By the time I was ready for the team matches she'd fallen asleep in Marli's lap, being completely worn out. This is why I decided to pack up and get changed right after the match. I thanked my opponent, did a quick review with my team mates and headed for the dressing room. We went home with Kaijuu (Kris and Tiamat hitched a ride with Peter), so Marli could get a tour of his new digs. I was also completely worn out, falling asleep at least once. Odd, how a busy day with only one real fight could wear me out so profoundly. We then went for dinner at Itoshii. It was bloody brilliant! They charge E24 for five rounds of dinner, each round allowing you three to four small dishes. By round three I'd had my fill of some great food: udon noodles, gyoza, curry rice and plenty of good meats. Kaijuu and Michel also seemed to enjoy their sushi a lot. Really great stuff! First off, I'm rather disappointed with my own performance in class today. After only a few rounds of kihon practice my head was spinning and I lost all sense of power in my arms. Like I was completely empty. Fifteen minutes later I was mostly fine again, which to me suggests that I need to do two things: properly dose my power output and build more and more endurance. Today's class revolved around shiai practice, that is to say: preparing for tournaments. Tomorrow a team from Renshinjuku Almere will be attending the dutch national championships. Nick, Jeroen, Houdaifa, Tiamat, Martijn and myself will travel to Zwolle to compete in two competitions. Each of us will participate in the individual competition for kyu-grade kendoka and the six of us will also form a team for the NK teams competition. The latter will be quite a challenge as we'll be going up against both kyu and dan-graded kendoka! As usual, class was started with kata training, which I did with Nick. A great experience, as both Nick and Ton-sensei showed me a few eye openers. Two of these are sketched above; left is correct, right is wrong. In kata #3, after the opening thrust by uchidachi, shidachi thrusts back. When doing so I used to move my arms in such a way that the bokken would become level, to stab the torso of uchidachi. I was now taught that the bokken should actually remain diagonal in a straight forward movement. The theory behind it being that it would not stab, but cut the torso. In kata #4, after stepping forward both kendoka strike men, to cross bokken at eye level. Uchidachi move in hasso-kamae, while shidachi moves in waki-gamae. 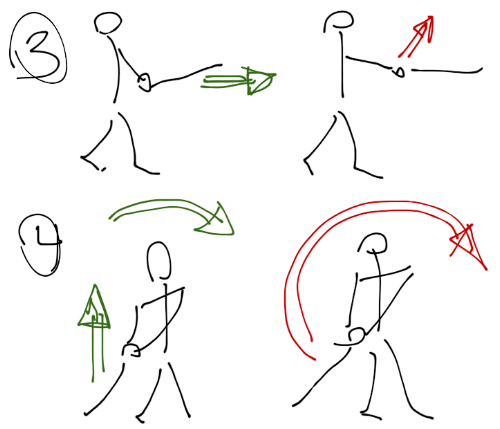 When making the strike from waki-gamae I used to make a circular arc, while the bokken should actually be lifted straight upwards, after which an arc is made. When it comes to footwork I stuck to my training goal for 2012 and focused on fumikomi. Part of this was achieved by also focusing on my pelvis. My natural stance (which really is bad posture) gives me a hollowed back and my tush tilts backwards. Today I really focused on keeping my pelvis tilted forwards, which worked miracles for my stance. I'm really curious about tomorrow! It'll be a long, long day... I'll be away from home from 0830 until 1830. Ouchie. Starting this week, my desk at the office has been rearranged somewhat. All of my gear's been moved to the right, thus providing unihibited view of the divider board. This board is now adorned with a piece of A5 paper, bearing the kanji shown left: enryo, 遠慮(picture source). Enryo is the Japanese concept of (and word for) restraint. The kanji consists of the words for distant and prudence. I've chosen this word as my mental goal for this year, next to my physical education goal of fumikomi. Why? Because restraint will help me both at work, in kendo and in my anxieties. At work, because I've repeatedly gotten in trouble for being too hasty. In kendo, because I show way too much of what goes on in my head. In my anxieties, because control over mind and body will aid in preventing and fighting panic attacks. Speaking of my anxiety disorder. I visited my therapist again yesterday and he's quite happy about my progress. He was disappointed that I had not continued with the progressive relaxation exercises, but was glad that I'd replaced them with concepts from kendo and tai chi. From here on I will be setting exposure goals for myself, where I simply go out and expose myself to situations I loathe, of ever-increasing difficulty. We will meet up only once more after this, after which my therapist is confident that I can continue the training on my own. Finally, just to keep track of stuff: in the middle of the night I had a mild bout of hyperventilation. A little while ago Marli ordered a beautiful set of bogu for me, from Japan. I was already impressed with Miyako Kendogu's service insofar that they provide both spectacle adjustments and worldwide shipping free of charge. But now I'm even more impressed because this free shipping is actually UPS Worldwide Saver! 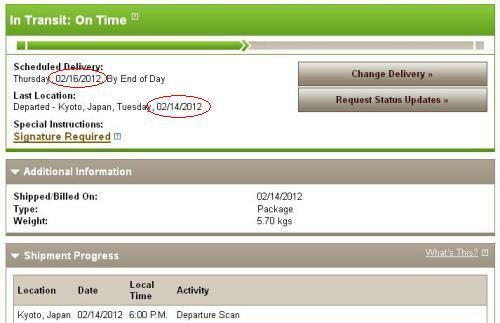 Meaning that the parcel will arrive in the Netherlands within three working days! Wow! In general I thought my test didn't go badly and I was feeling more confident than during my first exam. However, there was plenty of stuff that wasn't great. Sensei tells me that I graded for fourth kyu, but that third kyu would require a lot of hard work. A total lack of fumikomi. It wasn't even bad, it just wasn't there! There's a reason why my study goal for 2012 is fumikomi! Unstable footwork. It's sloppy and I tip over too easily. Ton-sensei remarked that in kata my stance and base are weak. There's no strength. My men strikes hit before I have my arm fully stretched. Thus I hit, then I stretch and flex my elbow upwards. This means, that I am at least 20cm too close to my opponent, which is detrimental. When making a strike I still move backwards before moving forwards. This slows me down a lot. Martijn also remarked that, while my kiai sounds good, it's not supported by focus or strong body language. In kendo practitioners generally all look the same. With some exceptions, everyone wears a dark blue uniform and a mostly black bogu. Some people have a differently coloured do-dai, like red or blue or hot pink :p But overall one can say there's little to no space for personalization. Tenugui come in greatly varying designs. From very simple and plain, to colourful and intricately designed. Many tenugui are 100% meant for decoration and are sold at rather steep prices. There are shops specializing in the sale of these design concious towels. And it's through their tenugui that kendoka get the chance to express a little individualism, character if you will. Many wear cloth with inspiring words or phrases. Others have cloth with their dojo's logo, or tenugui that were gifted at special occasions. Personally I already have quite a few to choose from and there are more on their way. Two plain ones, blue text on white, from a matsuri in Kyoto. Gifted by Niels-sama. Two plain ones, blue volcano on white, from Sakurajima. Bought during our 2011 holiday. One yellow, black and white tiger print. Made from a Hanshin Tigers happicoat. Gifted by Kaijuu. Two dark colours ones, with a skeleton and flower design. Gifted by my lovely wife, together with my bogu. One dark blue, orange and white, with various cats in period dress. Designed by Nagao Maru. Bought in Japan. One dark blue, with some accents, with white rabbits. Bought in Osaka.